The members and visitors that were enjoying soaring over the Eden Valley today were treated to an excellent days flying. Over the Pennines high ground it was even higher at more than 6500ft QFE and Martin Sandwith who ventured more than 100 Km North reported 6800ft QFE. What a marvellous playground we have. After over 4 weeks of very nice weather in an Easterly airstream I am pleased to report that we have the return of steady SW'ly winds this week and they will very likely stay with us for the next 2 weeks or more. Immediately we have had wave climbs to almost 8000ft and Silver X/C legs being completed by our eager pilots. Currently Ian Ashton (CFI of Bowland Forest) is in charge. I expect he will be joined by some of his own club members throughout the next week. Its always nice to see new faces enjoying our fabulous Skelling Farm airfield in the beautifull Eden Valley and overlooked by Crossfell. The 2018 season started very well. for the first 3 weeks we have had lots of good soaring weather, both thermal and ridge. The field is remarkably dry after the winters snow and rain. After the members enjoyed sole use of the field for the first 2 weeks we have welcomed visitors from Nene Valley and Husbos. Unfortunately this coincided with some really nice weather. Only 1 day was lost to an unflyable Easterly wind but the rest of the week was only thermic. Nearly everyone got away each day and some long flights over the Edenvalley and the Lakes were enjoyed. Then as they departed for home the inevitable SW'ly blew up. Derek Coker and Tony Walker had stayed on for the weekend and enjoyed 2 ridge days. Sadly were are currently plagued by a steady Easterly air stream however when possible we are still flying under the supervision of Ed Foxon. The new Rota is fully confirmed by our visiting instructors. No planned closures will take place in 2018. Are you aware that the CAA have given an exemption to us to delay the upgrade until 2019? IR 1079/2012 states that from 1 January 2019, all ground services will be operating on 8.33 kHz channels. Ground services across the UK will be converting to 8.33 kHz channel spacing at different dates throughout 2018, mostly driven by their annual licence renewal date. If a ground service is still using a 25 kHz frequency then you can still communicate with it using a 25 kHz radio. Once a ground service has converted, aircraft must utilize an 8.33 kHz capable radio to communicate with it. In practice, you can only continue to fly with just a 25 kHz radio if throughout your entire flight you only need to communicate on 25 kHz frequencies. Note, you must check regularly to confirm that your ground services have not converted. The CAA expects that most ground stations will have converted well before the end of 2018. After 1 January 2019, use of a 25 kHz radio will very restricted, principally to only the emergency frequency of 121.5 MHz. We have committed to the upgrade to our OGN which will relay FLARM to Pilot Aware equipped GA. Mark Johnson is doing this work and it is hoped to have the new installation on test and functional after we re-open on April 28th. Obviously until we have FLARM equipped gliders flying we cannot fully test the new kit. This will increase glider conspicuity in the area. It further underpins the benefit of fitting FLARM to your glider. I recommend you seriously consider this. Pilot Check System As mentioned in an earlier newsletter I have established a new system. This is based on a proven system in use at many clubs. Level 1 Post solo but still on daily/conditions checks. Level 2 Off checks (depending on conditions) but pre-bronze. Level 4 All instructors. Flying subject to the flying orders and overall supervision by the DI. The DI will place a number plate sign on the launch point trailer to show the current level. If conditions change significantly this can be changed throughout the day. It is the pilot’s responsibility to visually confirm the current level is appropriate for them to launch. If necessary discuss with the DI who may agree to you launching with additional briefings. Please Google “Mike Fox Gliding” and view them. Extremely good videos and useful to all of us. X/C Tasks. I have attached a list of easy tasks that anyone can try; some will not take you out of gliding range on a reasonable day. Those are therefore suitable for pilots who are pre-bronze with X/C endorsement. Not really X/C but they will get you to stretch your legs. As a confidence builder why not ask an Instructor to fly a task with you in a K13. They can also be flown solo in a K13 but check with the DI that the day is suitable. We are fortunate that all our approved DIs are also X/C pilots and can offer sound advice. The Club Tasks that Martin set some time ago are also on the BGA Ladder. They are 100, 200 and 300km badge flights for the more expert. You should all have ensured that you have access and can upload to the BGA ladder this year. IT’S VITAL WE DO THIS. I hope that all solo pilots will look at the tasks on a local map. If you are still training then please take the opportunity to ask your instructor if he is prepared to fly one of the shorter tasks with you. This of course depends on the pilots waiting and the suitability of the day but can introduce a very motivating experience into the routine of training exercises. Don’t forget the current Northern map. I strongly recommend that you investigate getting an electronic map and learn to use it; not essential but it is advisable, there are some low cost options available. We must avoid airspace infringements. If you are looking for your 50km Silver leg there are 2 possibilities, if in wave see tasks 6 & 7 on my list. Always carry a logger! It’s getting closer! Don’t forget that we start our 2018 season on 28th April this year. We will need as many members as possible on site to rig K13s and generally help with the many small tasks that we need to tackle quickly to allow us to get on with flying. We have an SB5e V-tailed glider for approved solo pilots to fly. This aircraft is X/C capable with modern instruments including an OUDIE. Some of you may remember it being flown some years ago at Skelling Farm when it was owned by Ben Dawson. If you want to be on its approved pilots list you will need to have a Bronze and 30 hours solo. It’s like a K6E to fly. Please try to get to the club early in May to take a check flight. The club will not be accepting visitors or trial lessons from 28th April to May 5th. Additionally visitors will not be on site before May12th. This gives us the first 2 weeks when we can concentrate on getting everyone safely back in the air even if you missed going to Denbigh. Further for solo pilots; should you not complete your checks early in the month you will still be able to fly solo subject to the normal currency requirements (see the Flying Orders) up to May 31st 2018. There have been two incidents at other clubs fairly recently. One involved a K13 which was winch launched on the nose hook. This resulted in the pilots being unable to release the cable at the top of the low launch due to angles and tensions and the K13 began to dive uncontrollably. The winch driver guillotined the cable, which resulted in a safe outcome. Another incident resulted from a possibly incorrectly adjusted hook and an additional problem with the back release. This time it was lucky that the weak link broke. I will discuss the need to ensure that our winch has regular guillotine safety checks. We also need to ensure that the winch drivers know that this does happen occasionally, and if they are in doubt about the situation that they must Guillotine the cable. In the two examples above, the winch drivers were reluctant to use the Guillotine. The Guillotine may be the only option if we can’t release for some reason at the top of a winch launch. Finally: Don’t forget we are taking a K13 to Lleweni Parc in April. Even if you have not already booked its not too late to decide to join us. WSW to W'ly. 3500' at ULL. 1st leg on ridge. We have published a response to Carlisle proposal, see below. The consultation ends on the 28th March and I hope that common sense prevails. Point 3 is particularly relavant. The British Gliding Association (BGA) represents 80 gliding clubs and some 7000 pilots. The BGA understands the need to change and modernise airspace and to ensure that airspace structures are proportionate and reflect the needs and safety of all users. It is our belief that this can only be done by understanding the needs of all users before airspace design work is undertaken; any other approach risks wasting resources, suboptimal outcomes and unnecessarily adversarial consultation activities. The location of Carlisle at the narrowest part of Great Britain surrounded by mountain, coastal and military areas requires particular care to ensure that all aviation needs are satisfied. We note and welcome that in paragraph 2.4 of the consultation document you confirm that you are not proposing any change to classification of airspace. Should you have any intention of changing this situation we request that you contact us well in advance of any formal consultation or preliminary design work. Nonetheless we have examined the current consultation document and would comment as follows. 1 The area to be overflown by the hold pattern will be over the Northern area of the Lake District National Park. The hold pattern, although centered on Caldbeck, will extend to Blencathra at the southern most point due to radius of turn etc. This has been designated as an area of outstanding natural beauty whose tranquility will clearly be impacted. 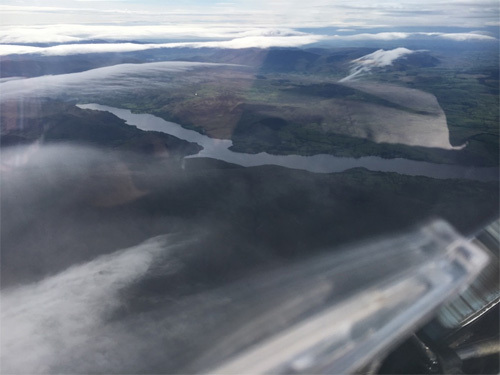 With a height of 2848' Blencathra is heavily frequented by walkers and visitors to the area and a hold starting from 5000' amsl has aircraft circling in a particularly inappropriate place. 2. The airspace at that location is often used by soaring gliders using ridge lift, thermal and wave conditions to operate from terrain height to the current limit of FL125 below N601. The collision risk is a concern if the hold is in use. 3. Because we, as soaring pilots, are familiar with the area we point out that in certain wind directions the atmosphere can contain both strong upcurrents and downcurrents. These can approach 1500ft per minute and can extend from terrain level to the upper limit of FL125. The area is also well known for atmospheric convergences which promote strong icing conditions. The combination of high terrain, cloud and icing would create unnecessary danger in a hold used by both CAT and commonly used twin-engine training aircraft. We suggest that the safety and passenger comfort of commercial or GA holding in this area would be compromised. Moving the hold North to a position over the Solway would solve these problems. For the reasons above we must record our formal objection to the proposal as written. If however the proposed 06 hold were moved to a better location over the Solway we would have no objection to the proposal as a whole. A reminder that if you are planning to fly under reciprocal membership at another club with which we have that arrangement you should have paid your 2018 membership and BGA fee to Edensoaring beforehand. So far I have very few confirmed members planning to join this trip. Please ensure that you contact me by March 1st if you plan to join us. Insufficient numbers will mean that we may not be able to take a K13. You have all probably heard of the plans to return passenger flying to Carlisle airport. At the moment this has only a small impact on our operation at Skelling Farm. The situation is being monitored by ourselves and the BGA. An appropriate response will be made and circulated in March, well before the deadline of the consultation. Last year there was an increased interest in mutual flying in 2 seaters. This is a very satisfying way to fly with a fellow member. Mutual flying privileges are available to any Bronze level pilot with 50 hours Solo in the logbook but are only issued by the CFI. If granted your logbook will be endorsed. When flying with a fellow club member P1 sits in the front seat and must carry out the launch, circuit below 700ft and landing. P1 must therefore be agreed before getting in the glider and P1 does the checks. X/C is allowed if P1 has the X/C endorsement. Please note that this is a locally applied privilege. F&F privileges are available to any Bronze level pilot with 50 hours Solo in the logbook. The difference is that P1 is sat in the back seat and must therefore be cleared for this by the CFI. As above a log book endorsement is made. This is good preparation for a BI/IFP rating and will involve detailed discussion about passenger safety considerations which is a priority. Even if an X/C endorsement is held, flying out of gliding range is definitely not permitted. Please note that this is also a locally applied privilege. Please have an up-to-date airmap for 2018. The BGA recommends that we all have electronic maps. This is essential if you are planning to fly X/C this year but very advisable if you are hoping to climb above cloud. Position location is almost impossible from great height and if looking for landmarks through holes in the cloud. We don’t have much airspace nearby but cannot risk infringements. If you go away from the local area it gets more complex. It is now fully confirmed by our visiting instructors. No planned closures will take place in 2018. Pilot Check System As mentioned in the last newsletter I have established a new system. The DI will place a number plate sign on the launch point trailer to show the current level. If conditions change significantly this can change throughout the day. It is the pilots responsibility to visually confirm the current level is appropriate for them to launch. Finally don’t forget that we start our 2018 season on 28th April this year. We will need a many members as possible on site to rig K13s and generally help with the many small tasks that we need to tackle quickly to allow us to get on with flying. Put it on your calendar now! I have changed the way we expect to do this to get these important checks for solo pilots done more effectively in 2018. The club will not be accepting visitors or trial lessons from 28th April to May 5th. Additionally visitors will not be on site before May12th. This gives us the first 2 weeks when we can concentrate on getting everyone safely back in the air even if you missed going to Denbigh. Further for solo pilots; should you not complete your checks early in the month you will still be able to fly solo subject to the normal currency requirements (see the Flying Orders) up to May 31st 2018. Well not exactly new but new to us. The SB5e which has been donated to the club will be ARC’d and available to suitably advanced solo pilots in the new season. It has modern instruments including an OUDIE and I expect it to be very popular. The trailer is excellent and should encourage X/C flights without retrieve problems. As we travel towards the year end I am thinking of and looking forward to next year. I am motivated to introduce some of the ideas we discussed at the AGM and some that I have developed myself. At the AGM we thought this to be a good idea. It seems that we are not the only club to develop this as I have learnt of several that are currently running this with some success. I would therefore like to hear from any established member who would like to help with this idea. I promise it will not take up to much time but effectively gives a new member a friendly face to meet or a voice to call to ask a question that they might feel a little basic but which can be important to them at the time. Hopefully this will help us to retain new members through the difficult first weeks when they know no one at the club. I am looking at this and will be discussing it with Martin Sandwith who is perhaps best placed to help generate the more advanced tasks. Rest assured there will be a whole range of basic tasks to encourage you to build up to the big ones. As BGA Ladder steward Martin has set some club tasks that can be used without declaration. Even pre-bronze pilots will be catered for with tasks that do not exceed safe gliding range on the appropriate days. Everyone will need a current airmap and preferably a GPS driven electronic map. Please remember to post flights, particularly those which include height gains over 5000ft, on the ladder. Flights from this year should still be posted to illustrate our use of the airspace above Skelling Farm and around the Eden Valley and the Lake District. It’s easy to use but if in doubt talk to Martin Sandwith or me. Currently if we search the Ladder for Edensoaring there is nothing. We may regret this in the future. Any member who wants to undertake this important step should be studying over the winter. I will be available at Skelling Farm for you to sit the exam on or after the 28th April 2018. The further and important X/C endorsement could also be arranged at another club; perhaps a few of you could do it together. I have changed the way we expect to do this to get these important checks for solo pilots done more effectively in 2018. The club will not be accepting visitors or trial lessons from 28th April to May 5th. Additionally visitors will not be on site before May12th. This gives us the first 2 weeks when we can concentrate on getting everyone safely back in the air even if you missed going to Denbigh. Further for solo pilots; should you not complete your checks early in the month you will still be able to fly subject to the normal currency requirements (see the Flying Orders) up to May 31st 2018. To make it easier for visiting DIs to manage your safety I plan to introduce a 1 to 4 level check system in 2018. Depending on your experience you will be given a sticker for your log book that will be signed off by me. Each level will clearly allow you to operate as defined by the rules of the system and other than asking the DI for permission to fly on the day and the decision is made. The operational privileges for each level will be notified later but for example level 1 will be post solo but still on daily/conditions checks. The DI will still have ultimate responsibility to assess the conditions but this should help smooth our operation. I will also extend this to visiting pilots where possible. Frank Bradley is trying to arrange some trips to other clubs during the winter layoff. Please support him. I fully endorse this idea; even if you don’t actually stay current it blows away the cobwebs of winter and can be fun as well. I am pleased to say that subject to final confirmations, we have a full Rota in place for the whole season. This shows the marvellous support we get from our visiting instructor team. I am sure all members want to thank them for their commitment to Edensoaring in the past and now the future. We have now closed for the winter. Our last days flying was superb with several wave climbs above 10000ft including a Gold height and a 5 hour flight. Many members will visit other clubs over the winter and hopefully return to Skelling Farm with renewed enthusiasm. I wish all members safe and rewarding flying, A Merry Xmas and a prosperous New Year. On 24/5/17 Patrick Eaton made an early start to a cross country to Kirkby Stephen and then turned to Buttermere. 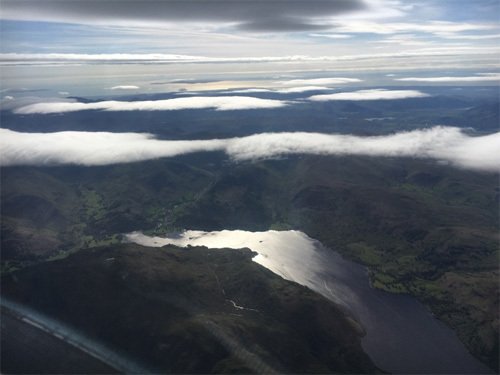 Patrick wrote; Things went well but the weather pattern became mixed and after Ullswater I aborted to return to site where I 'parked up' in thermal assisted hill lift at around 3,000 feet altitude. The air was visibly becoming stable and the early stages of lenticular clouds, a good sign of lift to high levels became apparent. Pushing into wind several times didn't find any lift of the smooth wave type being hunted. Not for me or anyone else. Decision, land or continue. With nothing to loose I ventured out and away, got the self sustainer engine out and fired up clear of the Club of course. Minutes later, 5,000 feet high at the front edge of a lenticular in 2 ft/sec lift with no engine. At 6,500 feet I decided to push forward and jumped the bridge between lenticulars, up to 7,500 ft and again pushed on, climbing to 8,600 ft at which point it was 17:45 and time to think of returning. Eden base might be waiting and so I decided to burn off the height to the Buttermere turn point out West near the coast (it felt like it) and return. Only temporarily blocked by a wave bar on my return which I rode up and over before an exhilarating 100knots return to Eden. Total flight lasted 7hr 15min, in the comfort of an armchair with a fantastic view. What a nice day!